What is Progressive Profiling for Gravity Forms? Progressive Profiling for Gravity Forms is a WordPress plugin which enables progressive profiling functionality on nominated forms and also the prefilling of form fields. What is progressive profiling and why do I need it? Progressive profiling is the process of collecting more information from a user from consecutive completions of the form. 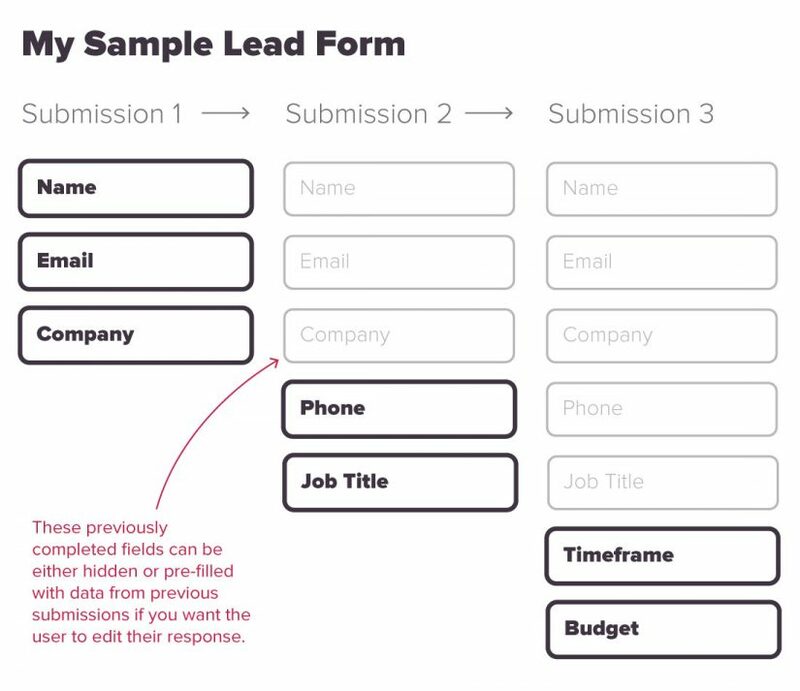 So for example the first time the user completes the form you might ask for their name, email, phone number and a custom message, but then the second time they complete the form you might ask for their email, job title, size of their company and the custom message. See what we did? Why bother asking for the name, phone number and other boiler plate information if we already know it! All we need is a unique way of identifying the user (which is primarily done via the email field) and this enables us to ask for additional information about the user the next time they complete the form. This is great for users because it saves them completing forms which will equate to a higher conversion rate of your forms, but it also can benefit you as it enables you to collect new information from additional completions of the form. It is a win-win situation and there’s no reason why progressive profiling shouldn’t be implemented on pretty much all of your forms. We believe in the relationship between your customer/client and your company, it should be respected and natural. If you are getting to know someone for the first time you don’t ask them for their most personal details, you save this after you have gotten to know them a bit more. You don’t want to chase away a customer by asking them more questions than on a tax return! With the power of progressive profiling, marketers and website owners can over time gather more lead intelligence whilst increasing lead conversions. Progressive profiling can help nurture lead workflows and can assist marketers by helping to identify leads at various stages of the buying cycle. 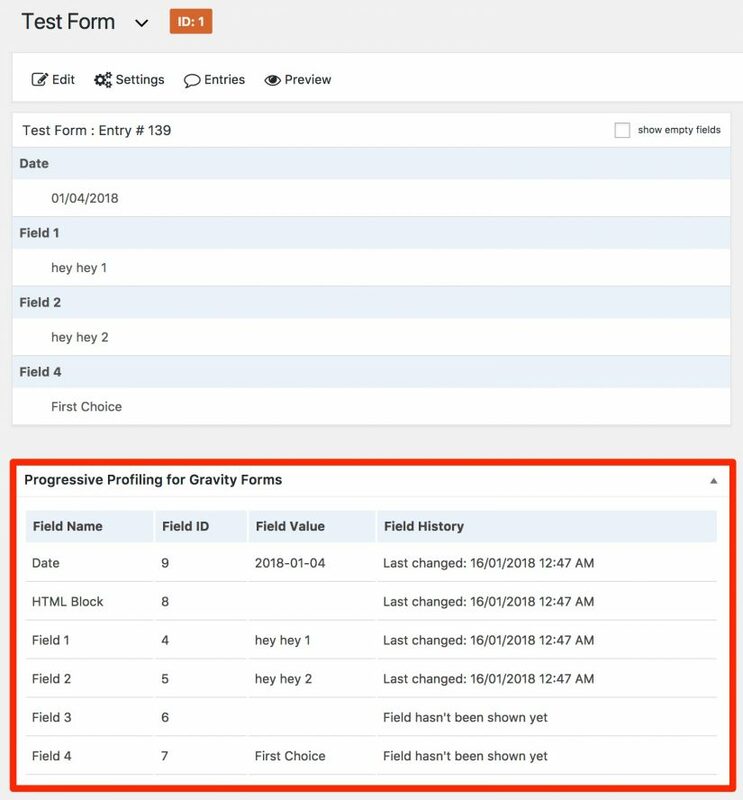 This makes Progressive Profiling for Gravity Forms a great plugin to work with existing CRM or email marketing systems you may use. What are some use cases and what are some of your progressive profiling tips? Make your consecutive form submissions pack a bigger punch. Re-convert and re-nurture dead or flailing leads with new offers. Better nurture leads by retrieving more information which can be used to better segment and identify leads in the purchasing process. Because new and old website visitors will see different versions of your form you can increase conversions for both of these audiences. This is particularly valuable for referral traffic from paid advertising, search engine traffic or from social media. Make surveys and other typically long-winded forms more bearable for visitors. What if you just asked one survey question instead of 20? Imagine how many people would complete that form! How does progressive profiling work on a technical level? Good question!Progressive profiling requires some method for the form to know if the form has been previously submitted or not. Progressive profiling utilises browser cookies to store information on previous form submissions to your site and utilising this information the plugin performs its smart logic to conditionally hide and show fields. What this does mean is if a user clears their browser cookies the gravity form will be reset to the starting position again. How does the plugin implement progressive profiling? Step 1 – In your form settings activate progressive profiling for your form. Progressive profiling can be activated on a per a form basis. The other option is a conditional logic section which will only show the field if all/any of the nominated fields have been previously completed. You can create as many field conditions as you would like. 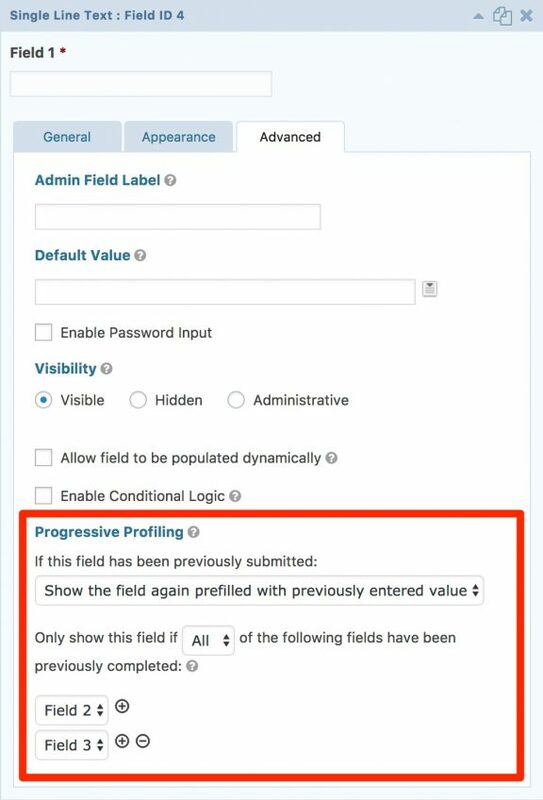 Please note the fields you can select from here are only from the form you are editing – you can’t choose fields from another form as the progressive profiling is form specific. 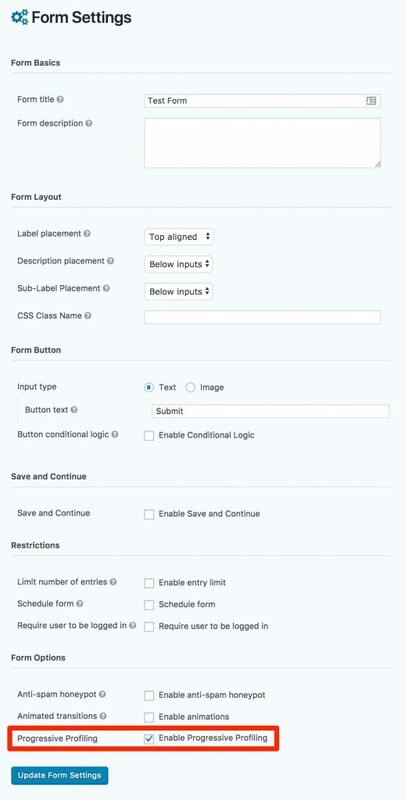 Step 3 – After a form has been submitted you will receive your typical Gravity Forms notifications and on the form entry page you will see an additional ‘Progressive Profiling for Gravity Forms’ meta box which contains the date a field has been last changed and if it has been seen by the user or not. Does this plugin work with 3rd party integration plugins? The short answer is yes absolutely! In fact we designed this plugin to work with our very own Pardot to Gravity Forms Connector plugin which can connect Gravity Forms to the popular marketing automation software Pardot. But providing the plugin uses a pretty typical integration setup with Gravity Forms it should work fine on other plugins which may integrate with email marketing and CRM packages. On sale now at just $20USD the Progressive Profiling for Gravity Forms plugin provides a powerful WordPress Plugin that can increase form conversions by making them more digestible whilst enabling you to collect new information from form recipients. Progressive Profiling for Gravity Forms includes free updates for 1 year and the plugin can be renewed for continual updates if necessary. Important: Please read the terms and conditions for Progressive Profiling for Gravity Forms here.